On October 25, 1923, young Marcel entered the French Seminary in Rome; the rector at that time was Fr. Henri Le Floch. He received the tonsure on September 19, 1925, in the church of the Roman Lateran Seminary from Bishop Giuseppe Palica. He received the minor orders of porter and lector on March 20, 1926, from the hands of Cardinal Basilio Pompilj in the Basilica of St. John Lateran. The minor orders of exorcist and acolyte were conferred on him on April 3, 1926. Marcel Lefebvre had to interrupt his priestly formation to perform his military service in France. After his boot camp training in Mourmelon, he was assigned in December 1926 to the 509th Light Tank Regiment in Valenciennes with the rank of sergeant. He resumed his studies at the French Seminary in Rome on November 17, 1927. The rector of the institution now was Fr. Cesar Berthet. From 1927 to 1930 Marcel Lefebvre served as a master of ceremonies there. He was made a subdeacon by Bishop Carlo Raffaele Rossi on March 30, 1929, at the Lateran Seminary, and finally received the diaconate on May 25, 1929, from the hands of Cardinal Pompilj, in the Basilica of St. John Lateran. Concurrently he completed his ecclesiastical studies at the Pontifical Gregorian University, where he earned his doctorates in philosophy and theology. 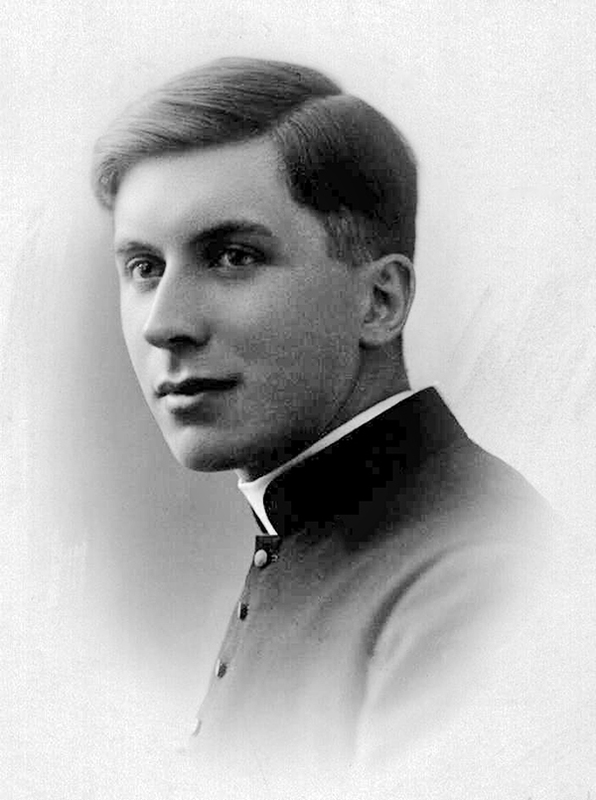 Marcel Lefebvre was ordained a priest on September 21, 1929, by Bishop Achille Lienart in the chapel of Our Lady of the Sacred Heart in Lille (France). Fr. Lefebvre was appointed curate in a working-class suburb of Lille, in Lomme. Wishing to become a missionary to the Africans, in 1931 he entered the novitiate of the Holy Ghost Fathers; he made his religious profession on September 8, 1932. On November 12, 1932, he embarked for Gabon. At first the Bishop of Libreville, Bishop Louis-Michel-Francois Tardy, put him in charge of the formation of African priests at the seminary in Libreville, where he taught dogmatic theology and Sacred Scripture. In 1934 he became the seminary rector. On September 28, 1935, he made his perpetual vows in religion. Three years later he was sent into the bush to evangelize several regions around Donguila, Lambarene and N’djole. There he learned the local language, Fang. Fr. Marcel served in this way as superior of various missions in Gabon until 1945, when he was summoned by the Provincial in France. Meanwhile Marcel Lefebvre lost his mother, who died a holy death in 1938, as well as his father, Rene Lefebvre, who was arrested in 1941 by the Gestapo for his activities in the Resistance. He died in February 1944 at the concentration camp in Sonnenburg, his rosary in hand, a victim of the Nazi insanity.